Step by step to Controlling Excellence. Obtain not only a key competitive edge, with both hard and soft skills, but also degrees that companies highly value – the Controllers Certificate CA and Controllers Diploma CA. 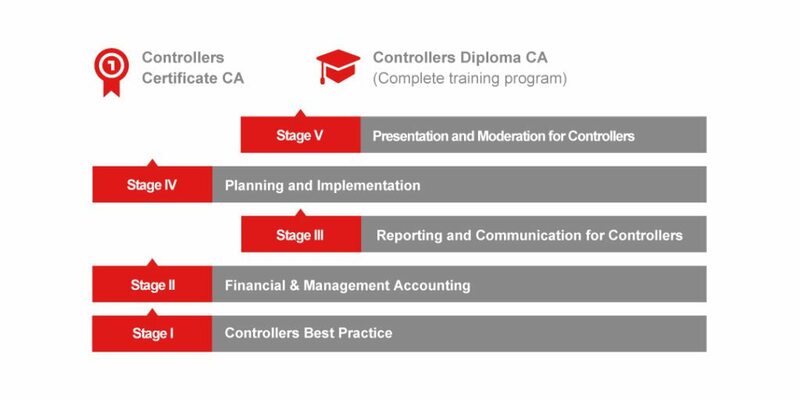 Controllers Training Program in five stages has been rigorously adapted over the last 47 years to reflect the latest developments in controlling. Our flagship seminar – stage I – has been conducted to date more than 1,400 times as public seminars and in-house trainings. Each stage can be booked individually and is scheduled many times throughout the year, making it easy to include in your busy calendar. Controllers Training Program makes you fit as Controller 4.0 and prepares you optimally for the upcoming challenges of digitization and globalization. To help you apply your newly acquired skills in practice, numerous feedback sessions are held during the seminar to ensure you have a thorough understanding of the seminar contents. Stage I conveys an overview of the most important components of the modern controlling in both its connections and practical implementation. Stages II and III extend, supplement and deepen the controller’s toolbox. Stage III additionally teaches the essentials about communication and leadership skills. The workshop stages IV and V focus on the application and implementation of the tools developed. The training of presentation and moderation skills is intensified. Expand your skill set and sphere of influence. Even the best instruments, tools, results, reports and charts are only as good as the reasoning and presentation skills of the controller. After all, in order to create transparency in a company controllers need an entrepreneurial understanding and psychological flair. The training methods in our seminars take this ambition into account: they focus on the business tools of controllers and their actual application in corporate practice. We offer you one format in Stage I in English: The English training is designed as an intensive retreat-training with evening work and a lively exchange of experiences both during and after the seminar. It takes place from Sunday evening until Friday afternoon in a quiet location at one of our seminar hotels. Non financial managers from sales, marketing, production etc. 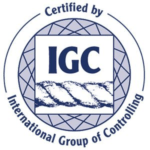 Obtaining the Controllers Certificate CA, which requires that you complete stages I, II and IV of the Controllers Training Program in five stages, demonstrates you have attained proven, certified controlling skills. It is intended for participants who are seeking a more streamlined path through the stages program and want to concentrate initially on methodological and functional topics. Controllers Diploma CA certifies your controlling excellence in the role as business partner of management. By successfully completing the Controllers Training Program in five stages your work in actual controlling practice will demonstrate proven communication skills and functional expertise. A self-examination is conducted at the end of stage V when participants make presentations that are evaluated by the trainer and the seminar participants. Graduates of the five-stage program (Controllers Diploma) have the opportunity to continue their professional education by participating in the part-time MBA program offered by the FOM University of Applied Sciences (www.fom.de).